Have you set your 2008 goals? Happy New Year and welcome to the first issue for 2008. I hope all of you had a relaxing break over the holiday period and ready and refreshed to tackle the year ahead. We are into February already and a good time to quickly review your goals and see if you are on track. If you have not set yourself some goals then you still have time to do that. Do they focus on my priority areas? Will they help me become a better person? Will they enable me to get closer to where I want to be long term? According to world renowned success coach Jim Rohn, the major reason for setting a goal is for what it makes of you to accomplish it. In the process of setting and achieving goals you embark on a journey of personal growth and development which has far reaching consequences on your life than any of us are really aware of. If you have not already done so then evaluate all areas of your life – e.g. family & relationships, career, financial, health and spiritual. For each of these areas reflect on your gaps and where would you like to be. Then use this knowledge to write down a few goals. They could be a combination of both short and long term goals. Stretch and push yourself during this exercise. Don’t set run-of-the-mill goals. If you have already set your goals then revisit them and see if they stand the scrutiny of the above questions. It is best if you keep your goals to a manageable few. Better to start with a few than have so many that you get overwhelmed and do not achieve any at all. If you are serious about goal setting and seeing the positive impact this can have on your life then I would highly recommend Jim Rohn's One Year Success Plan. It is one of the best step by step goal setting and mentoring programs I have come across. This is a great chance to set yourself up for success in 2008 so make the most of it! PS: Next issue I will show you how to create an individual development plan for 2008. I completed this eBook over the holidays. 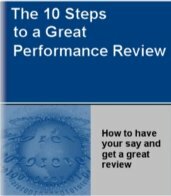 In it you will find all that you need to know about how to get a great performance review. It is packed with handy hints and useful tips. For a limited time you can get five free eBooks and also avail of a special 50% discount! I love Site Build It - the complete package I use to develop and host my site. Check it out and put your passion to good use! They are offering a special buy 1 get 1 free deal for a limited time.